We Close 95% of Audit Cases After the Initial Meeting with the IRS Agent! We have a team of credentialed employees (including QKA, QPA and ERPA) that have demonstrated proficiency in representing clients with plan audits and have consistently achieved successful outcomes. We take ownership of the process, prepare the audit forms and handle the communications with the auditor, leaving minimal responsibility to the employer. What is the Purpose of a Plan Audit? A plan audit conducted by the IRS ensures that plans follow regulatory compliance requirements to maintain their status as qualified retirement plans. How are Plans Selected for Audits? Some plans are audited as a result of red flags from reviews of 5500 Forms. 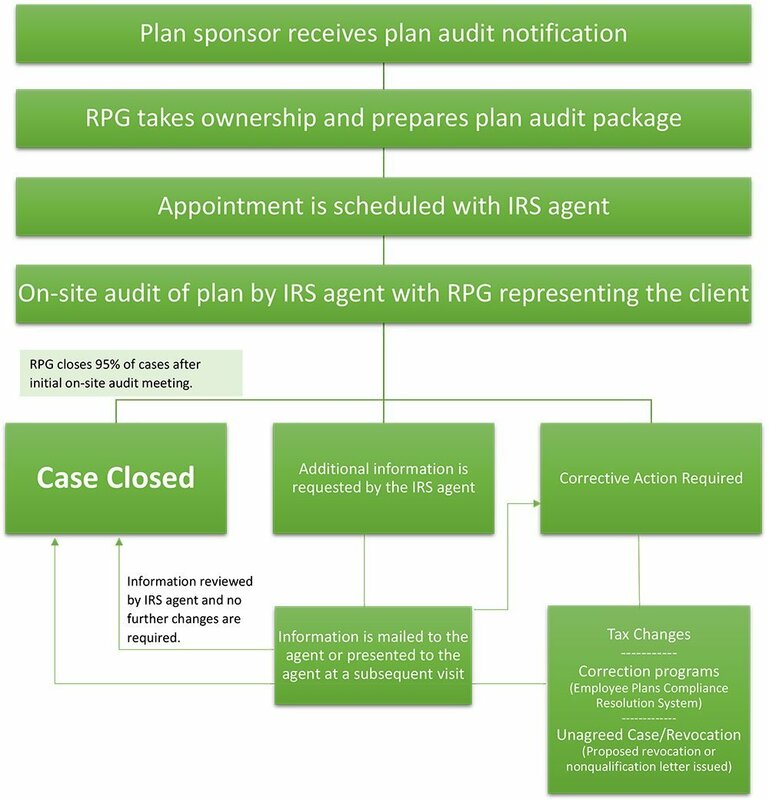 The majority of plans audited by the IRS or DOL each year are randomly selected. Who Can Represent Me in an Audit? An attorney, accountant, enrolled agent, enrolled actuary, or the person who prepared and signed the return. What are the Areas of Review? Eligibility, participation, and coverage— Are eligible employees properly participating? Vesting—Have service and vesting been properly credited? Discrimination—Do contributions, benefits, rights or features favor highly compensated employees in a non-compliant manner? Top heavy requirements—Have minimum contributions and benefits, and accelerated vesting, been provided? Contribution and benefit limits—Are contributions and benefits within applicable limits? Funding and deductions—Are contributions sufficient and timely, and deductions within applicable limits? Distributions—Are distributions properly made and timely and accurately reported? Trust activities—Is the trust operated for the exclusive benefit of participants and in accordance with fiduciary standards? Plan and trust documents—Does the form of the plan and trust timely meet applicable tax law? Returns and reports—Were federal returns and reports timely and accurately filed? Last year, I received a notification from the IRS that my 401(k) plan was being audited. I called my provider and they said that they don’t provide audit support. A friend referred me to RPG Consultants. When I reached out, they seemed extremely knowledgeable in all aspects of the retirement plan and the audit process. They walked me through the entire audit, explained everything to me and guided me through the corrections program to resolve compliance issues with my plan. The audit is complete, my plan is in compliance and I am proud to be an RPG client. When I received a plan audit notification, I forwarded it straight to RPG. As I am a veteran RPG client, I was confident that they’d handle it seamlessly. It was such a relief to know that I did not have to worry about collecting all the paperwork or answering the extensive list of questions on the audit forms. Our on-site audit was a breeze, and Evan was able to address all of the questions for the auditor. The auditor even commented on how uncommon it was to find a company so prepared for an audit with all aspects of their plan in good standing. For me, it was business as usual. It is important to be familiar with the 401(k) audit compliance rules and to know the difference between an annual 401(k) audit performed by a CPA firm and an IRS or DOL 401(k) plan audit. An annual 401(k) plan audit is conducted by an independent qualified public accountant and is submitted with the Form 5500 annual filing. A plan audit conducted by the IRS or DOL is often randomly selected and ensures that plans follow regulatory compliance requirements to maintain their status as qualified retirement plans. Apart from the IRS/DOL plan audits discussed above, there are annual financial statement audits that are required for some qualified retirement plans. These audits are generally performed by independent qualified public accounting firms. Certified auditors who perform financial audits should be familiar with ERISA, IRS and DOL regulations, as well as other requirements directly associated with employee benefit plans. RPG Consultants coordinates with CPA firms and financial auditors to gather the data needed for the financial audit package. Learn about the groups of plans that the Department of Labor requires to have annual financial statement audits by an independent qualified public accountant, or CPA. Learn about the requirements for a financial audit, the importance of selecting a financial auditor and what you can do to make the audit process run smoothly.